Helping you to make light work of your laundry pile, our range of LG washer dryers will allow you to enjoy fresh and clean clothes after every wash. So, if you’re looking for a high performance washing machine, you’re in the right place! 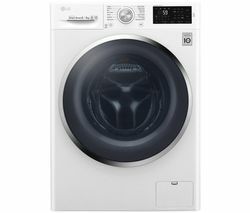 Many of the models in this range feature high-efficiency 6 Motion Direct Drive technology that cut energy cost and water consumption, compared to conventional washing machines. Whether you’re washing your favourite pair of jeans or your bed linen, a LG washer dryer will ensure that you’re always able to enjoy exceptional cleaning and drying results that will leave your clothing looking and feeling its best. Featuring the latest state of the art technology, many of these models come complete with an electromagnetic motor. Positioned at the back of the drum, this feature pre-selects the ideal rinse and wash for your load requirements, saving you both time and money! With wash load capacities of up to 12 kilograms and drying load capacities of up to eight kilograms, you’re sure to find a LG washer dryer that meets the laundry demands that come hand in hand with your household. Our range features LG washer dryers that are perfect for big and small families who require a reliable, smart and high performance washer dryer that won’t let them down when it comes to tackling their laundry pile. 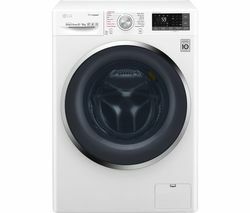 If you’re looking for a tumble dryer, then look no further than our Hotpoint tumble dryers.